The Industrial Internet of Things lies at the heart of the company's deals with Alstom and Baker Hughes. Here's why it's good news. It's no secret that General Electric Company (NYSE:GE) intends to take a leadership position within the Industrial Internet of Things (IIOT), but what's less discussed is how integral it all is to the company's acquisition strategy. In a nutshell, the Baker Hughes Incorporated (NYSE:BHI) and Alstom energy assets deals were much more than mere industry consolidations. They actually represent a strategic deployment with IIOT at its heart. Here's how and why. Whichever way you look at it, we are in a moderate growth environment. Forecasts for U.S. GDP growth of 1.6% in 2016 and 2.2% in 2017 are hardly inspiring, and it's not enough for companies like General Electric -- whose size and diversification make it hard to truly escape broad-based economic conditions -- to rely on end-market growth. Indeed, CEO Jeff Immelt cut the company's organic revenue growth forecast to just 0%-2% for 2016. The chart below shows that it's really nothing new. 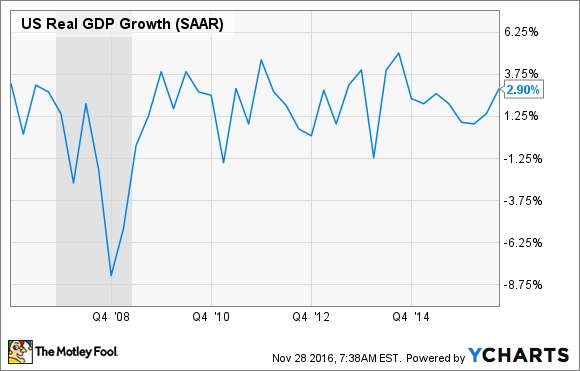 In fact, GDP growth has been variable, but moderate, ever since the last recession. What's a mega-cap company supposed to do when top-line growth prospects look limited? US Real GDP Growth data by YCharts. Having decided to pivot back toward its industrial roots by selling its GE Capital assets, the next option ahead of GE was to try to "pick winners" -- to invest in certain sectors of the economy that might win out over others. Unfortunately, the raft of oil and gas businesses GE bought between 2010 and 2014 -- which would surely be cheaper had the company bought them this year -- is a testimony to how difficult picking winners is. No matter, Immelt has other ideas. General Electric is generating its own growth drivers, and the industrial internet is at the heart of it. For example, at GE's recent Minds + Machines event, Immelt outlined expectations for $15 billion worth of digital orders by 2020 alongside $1 billion of additive manufacturing orders. (The latter is a manufacturing technology utilizing 3D modeling and printing.) For reference, the company's revenue over the last four quarters is around $124 billion. However, the company's acquisition strategy is also a key part of its IIOT plans. General Electric is hoping to profit from IIOT in general, but IIOT is also very important to the rationale behind the Alstom and Baker Hughes deals. The Alstom deal is certainly about industry consolidation, and creating cost synergies as a consequence. And it's about adding Alstom's steam power solutions to GE's gas power offerings in order to create a powerful combined-cycle solution. However, it's also about digitizing Alstom's existing installed base with GE's IIOT solutions. In a sense, GE is buying the opportunity to expand its IIOT business. General Electric's digital solutions help customers optimize assets. Image source: General Electric Company. Moreover, the benefits are tangible. For example, at the Minds + Machines event, GE Power CEO Steve Bolze outlined how the 25 power plant customers he'd signed up from last year had generated 3% more plant efficiency, 5% more reliability, and a 25% reduction in operation and maintenance costs. There are also significant cost synergies to be generated from the Baker Hughes deal: $1.4 billion by 2020. In addition, revenue synergies ($400 million by 2020) are expected through the integration of GE's oil and gas technology with Baker Hughes' service technology solutions: The plan is to create a fully integrated offering. [T]his transaction accelerates our capability to extend the digital framework to the oil and gas industry. An oilfield service platform is essential to deliver digitally enabled offerings to our customers. We expect Predix to become an industry standard and synonymous with improved customer outcomes. Creating a digital twin helps optimize asset performance management. Image source: General Electric Company. Ultimately, the Alstom and Baker Hughes deals amount to more than just investments in complementary businesses in order to generate cost synergies. While those aims are worthy in themselves, the deals also represent a key part of GE's expansion of its digital capability. In a low-growth world, Immelt is finding a way to increase the company's long-term earnings potential while claiming first-mover advantage in the IIOT space. It's a strategic development that investors should welcome.